Cyprus's ruling party says a solution to the bailout crisis within the EU rules may be possible within "the next few hours." 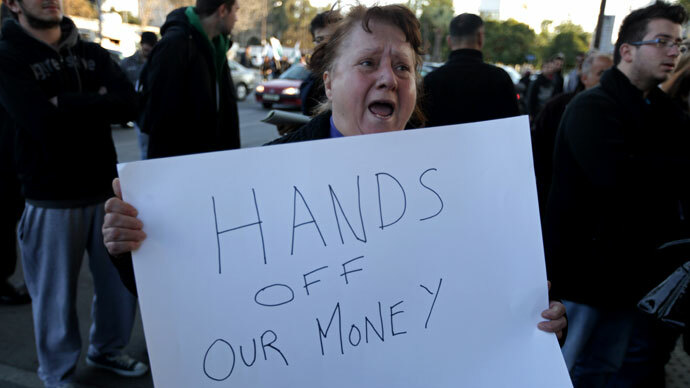 The much-debated levy on Cypriot bank deposits is "clearly on the table," according to the country's Finance Minister. "I think that [levy on bank deposits] is clearly on the table, that is something that needs to be discussed to see whether a levy on deposits of some sort ... would make a contribution to finalising the package," Finance Minister Michael Sarris has said. The parliament is due to adopt new emergency legislation to secure the EU bailout after Russia said it would not help. "There is cautious optimism that in the next few hours we may be able to reach an agreed platform so parliament can approve these specific measures which will be consistent with the approach, the framework and the targets agreed at the last Eurogroup," the deputy leader of the Cyprus's ruling Democratic Rally party Averof Neophytou said on Friday, Reuters reports. Nicosia introduced emergency legislation to parliament late on Thursday to secure a bailout deal with international creditors as the island state faces an ultimatum from the ECB to agree on the bailout by next week. The parliament is to debate on the emergency legislation on Friday, as MPs say they needed time to consider the new legislation. The bills presented include plans to recapitalize its banking sector, eight times the size of Cyprus’ €17 billion economy, and lay losses on big depositors. The finance minister and Cyprus Central Bank are granted emergency powers to introduce any restrictive measures on banking activities to stop money flooding out of the Cypriot banks when they reopen next week after 10 days’ holiday. This includes restructuring Cyprus’ second-largest lender, Popular Bank (Laiki). Laiki would therefore be split into a ‘good’ and ‘bad’ bank. The larger savings accounts would reportedly be placed in the ‘bad’ bank and face losses of up to 40%. 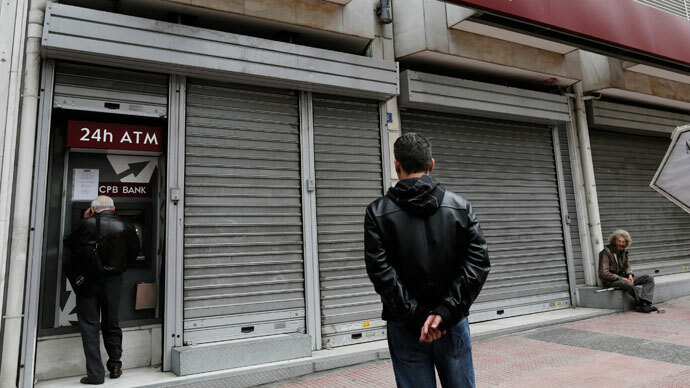 “Otherwise, Laiki Bank will be led to immediate bankruptcy and termination of its operations, with catastrophic consequences for the workers, the depositors in their entirety, our banking system and the country’s economy,’’ Demetriades said. He added that small deposits under €100,000 would be guaranteed and bank jobs would be safeguarded. Within the new plan Cyprus government also considers creating an "investment solidarity fund" to accumulate €5.8 billion required to secure the EU bailout. 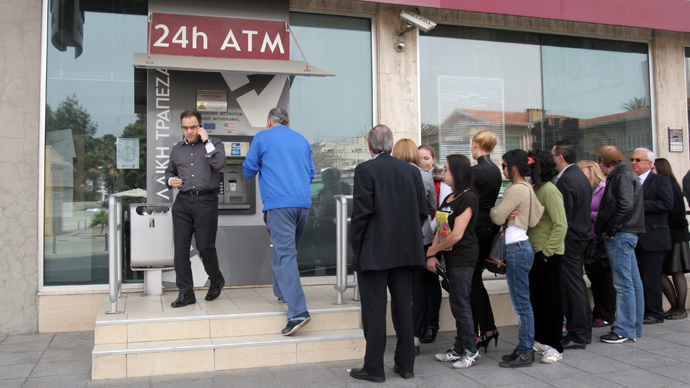 In the meantime people in Cyprus capital of Nicosia are queuing in front of cash machines. Late on Thursday people staged protests outside the government building after Laiki imposed a €260 limit on cash withdrawals. Cyprus hoped to get help from Russia. However, the two-day negotiations between Cyprus's finance minister and his Russian counterpart failed to provide anything tangible. Michalis Sarris left Moscow empty-handed on Friday after Russia said it would not help out Cyprus before it agrees a bailout deal with the EU. 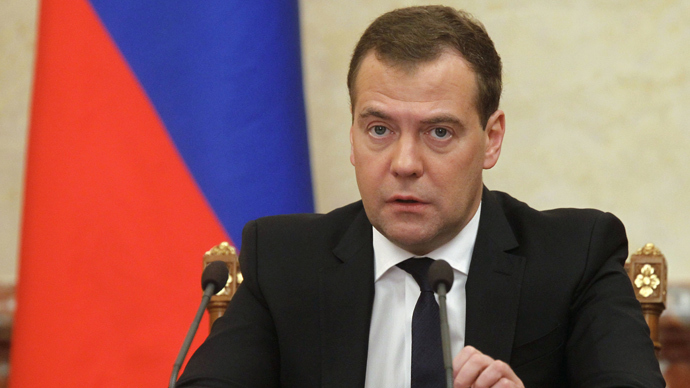 Russia has not withdrawn from efforts to settle Cyprus' problems, said Prime Minister Dmitry Medvedev on Friday. "Concerning our involvement in the process, we have not closed the door. We did not say that we would not discuss anything any more, or that we don't want to listen to anyone, or that Cyprus is a member of the European Union and leave us alone," Medvedev said at a joint press conference with European Commission President Jose Manuel Barroso. According to Medvedev Russia has "clearly understandable economic interests in Cyprus." "But we will be ready to discuss various ways of supporting Cyprus - the more so since we did provide support, a loan - after a final scheme is negotiated by the European Union and Cyprus." It's been reported Cypriot Finance Minister Michael Sarris has been asking for a $5 billion loan, but had no luck there. "It's been out of the question because the EU has set a limit for debt Cyprus should not go over, and this particular loan was above this limit," Russia's Finance Minister Anton Siluanov said on Thursday. However Russia did offer a helping hand earlier this week when Russia’s energy major Gazprom allegedly made a private bailout offer to Cyprus according to the New York Times on Wednesday. The island was offered the money needed to keep it afloat by selling Gazprom exploration rights to offshore gas deposits in the Mediterranean. Gazprom however refused to comment on the news or even confirm it made such an offer. Michael Sarris has denied there was such an offer, but he did identify the divided island's offshore gas riches as one area in which Russia could invest. It didn't take long for Cyprus's neighbor Turkey to react to the news. 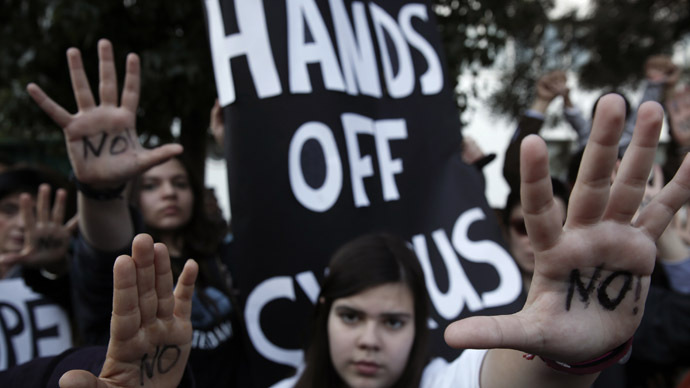 On Thursday Ankara said it would challenge any move by Cyprus regarding offshore gas exploration. "This resource belongs to two communities and the future of this resource can't be subject to the will of southern Cyprus alone. (We) may act against such initiatives if necessary," one of the Turkish officials told Reuters. But Russia's help in bailing out Cyprus would only speed up the country's demise by undermining its value as a banking center, political expert Sergey Karaganov believes. “I don’t think we should be involved in bailing out Cyprus because if we start to bailout Cyprus it will be expensive. And we must understand that if we want to eventually get a gas field, which is a big question, and the resort – well it’s worth it, but then we should take into consideration the bill. If we bailout Cyprus against Europe, against the World Bank, and the international financial system, it will cease to exist as a banking center, which is the main value of Cyprus internationally,” Karaganov told RT. Earlier on Thursday the ECB gave Cyprus till next Monday to accumulate the money to secure an international bailout. Otherwise the bank said it will pull out of the negotiations and step aside. Hence Cyprus will face a collapse of its weary financial system and could even be forced out of the euro currency zone.